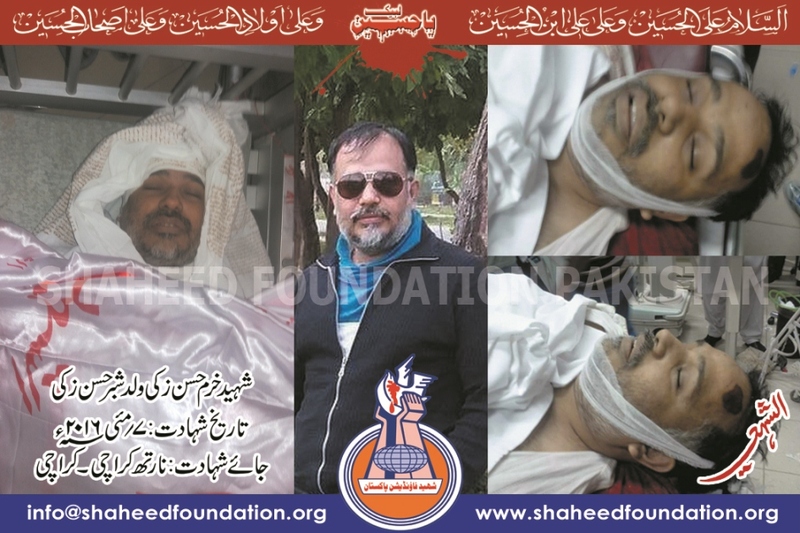 Karachi:'Fearless' Khurram Zaki laid to Rest Amid Tears,Sobs and Wails! Shaheed Khurram Zaki,the slain civil society activist was laid to rest amid tears ,sobs ,wails and cries at Wadi-e-Hussain Graveyard in the presence of scores of colleagues,disciples,representatives of various shia muslim organizations and civil society members .The burial took place shortly before maghrebain prayers tonight. Moving scenes were witnessed on the occassion as friends,relatives and acquaintances kept crying for their irreparable loss. Earlier his namaz-e-janaza was held in front of CM house Karachi according to his last will. The caravan ,took off for CM house shortly after zohrain from Ancholi Society block 20 with the objective to realize his last will which also included that the FIR be registered against Mulla Abdul Aziz and Orangzeb Farooqi. 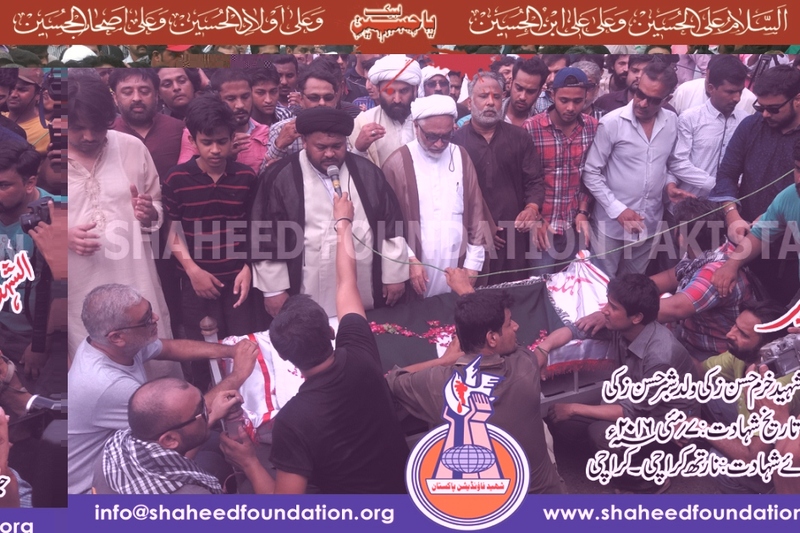 Charged speeches by Ulema-e-Karam,family of the martyr and complete moral support lent to the wishes of the heirs of martyrs by the protesting momineen,were the highlights of the day.Allama Nazir Abbas Taqvi led namaz-e-janaza following FIR's copy was handed over to Ulema. 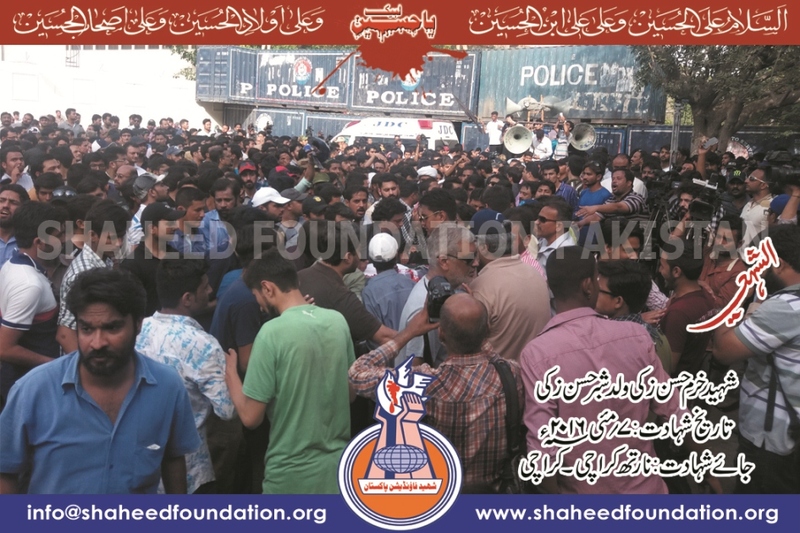 The namaz-e-janaza was attended in large numbers by people from all walks of life as well as media fraternity to whom Shaheed Khurram Zaki was quite close. 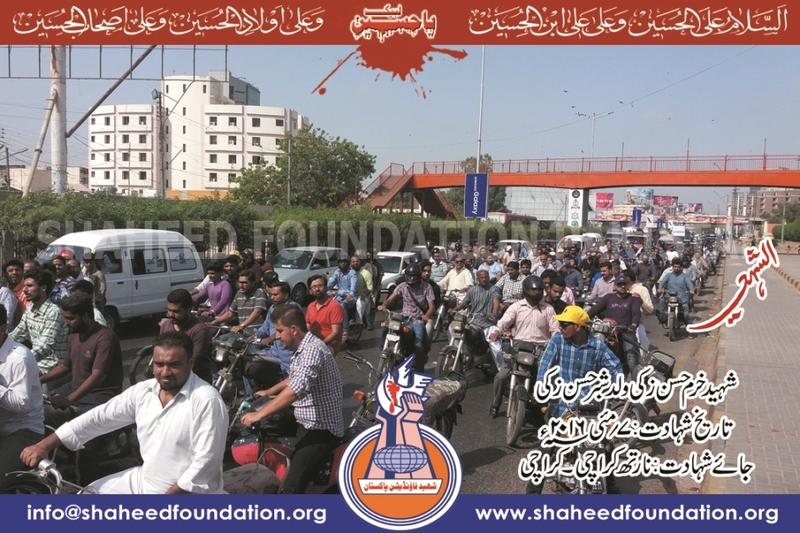 Following the namaz,janaza procession headed off for superhighway via Shahra-e-Faisal and Malir Halt. Syed Khurram Zaki Son of Syed Shabbir Zaki was born to a respected Sunni family.He converted to Shia faith after rigorous research some years back .He had tremendous grip on Islamic history and Quranic sciences. He introduced the teachings of Ahlulbayt[AS] to other muslims and non-muslims as well,a lot of whom embraced the faith inspired by the truthfulness of teachings as well as the personality of Khurram Zaki. Khurram Zaki,was known for his extremely fearless character, a common notion about him every one who even had a slightest of acquaintance with the person ,was quick to observe. He single handedly used to often raise placards and banner outside the terrorists dens of Sipah-e-Sahaba and Lashkar-e-Jhangvi in protest against the killings of Shia muslims,often accompanied by his family members. His restless struggle for shutting up and cutting out the voice of terror sponsoring mulla abdulaziz of Lal Masjid,alongside other equally brave colleagues in civil society belonging to Sunni faith,was exemplary ,although the cause was considered extremely popular,matter of factly,these brave workers of civil society, often had to stage protests with a few family members and friends only. 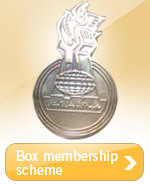 Khurram Zaki was considered to be the lynchpin of the civil society activism,even by adversaries,a charge which he vehemently and humbly denied,despite all the background of his single handed efforts,in some of his video recorded messages earlier,where he called the movement ,an all inclusive movement,representing all oppressed sections of the society. He had been receiving threats continuously ,both directly and veiled threats from various takfiri terrorist entities,a hint to which he had given during his videofied message. Despite,being extremely a known and recognized person,he was such a spirited person with almost a super-natural fearlessness,that he used to mix and mingle with everyone,visit most dangerous of the areas,perhaps,that's what also won him,many sincere friends whom he influenced through the teachings of Ahlulbayt[AS]. Khurram Zaki,in short was not just a person,he was a phenomenon,in himself. 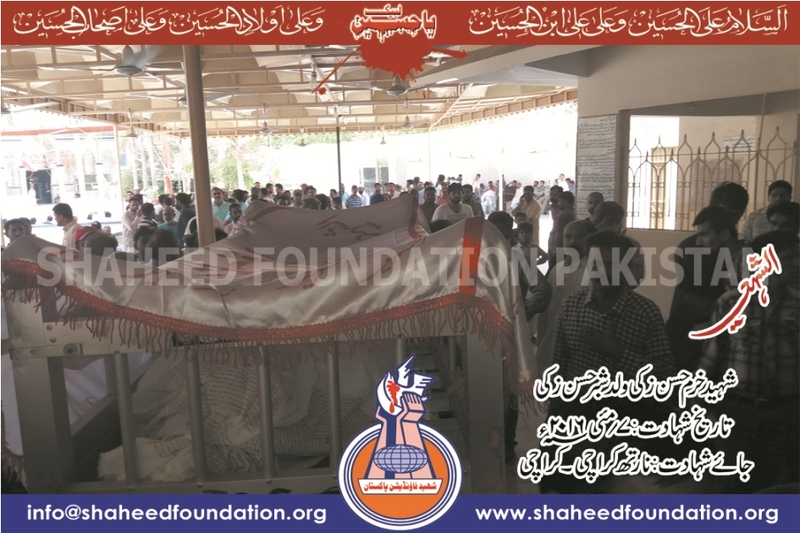 The only thing that reverberates at the time of compiling these lines based on experiences of people who had been in touch with him at his namaz-e-janaza procession,is the one liner from Shaheed's mother which she said during her brief speech. "merey betay ko yaad rakhna"
Khurram Zaki has achieved the sublime grace of martyrdom but his mission remains alive.All men die,few really live.